In April of 1892, Gladys Louise Smith was born in Toronto at 211 University Avenue (to be exact,) where her father, John Charles Smith worked a variety of odd jobs and her mother, Charlotte Hennessey, looked after her and her two younger sibling... Jack and Lottie. Gladys would have few memories of her father though, as he passed away in 1898 from a blood clot he received after an injury while working as a purser on a Niagara steam Ship. With her mother doing work as a seamstress as well as taking in borders, the family struggled along... until one of the boarders, a theatrical stage manager by trade, suggested that young Gladys might consider taking to the stage (even at the tender age of seven,) and after her first "gig" playing two parts in The Silver King at Toronto's Princess Theatre, a star was born. Staying with acting, which she did very well with, Gladys ended up eventually in Hollywood after a fairly good career (and a name change,) and was screen tested in 1909 by the legendary D.W. Griffith at the Biograph Company... Gladys, now know by her stage name of Mary Pickford, went on to be one of the greatest movie stars of the silent era... even being nicknamed famously, America's Sweetheart... and marrying none other than the equally famed Douglas Fairbanks. Fairbanks bought Mary a home which is a place of legend still... Pickfair, they called it... 1143 Summit Drive, San Ysidro Canyon in Beverly Hills. 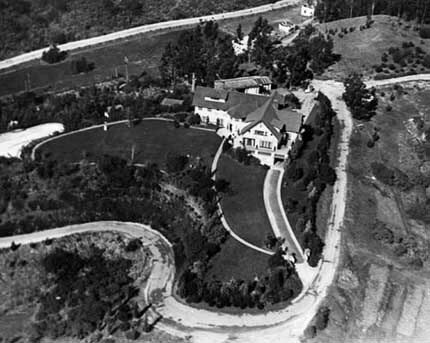 Aerial view of Pickfair, 1920. Starting life as a hunting lodge, it was renovated in the extreme to eventually become a four story, twenty-five room mansion with every trapping you could imagine for the new royalty of the time... tennis courts, stables, servant's quarters... a place fit for Hollywood's reigning royalty... which is what the couple indeed were. In the 1920's, Pickfair was the centre for all Hollywood society. You name them, if they were famed, they probably were at Pickfair at some point. Although Fairbanks and Pickford were divorced in 1936, Mary continued to live in the home with her new husband Buddy Rogers (they married in 1937) until her death in 1979. In 1988, the house was purchased by Pia Zadora and her husband Meshulam Riklis who, despite a large amount of criticism, even from Douglas Fairbanks Jr., announced they planned significant renovations to the home, considered by many to be bordering on one of the most important and historic homes of and for Hollywood and the American early cinema... but these renovations were worse than the couple reported, as they in fact demolished the massive renovated hunting lodge in favour of a "Venetian style palazzo". Pia Zadora defended the destruction by claiming the original home was infested with termites. This said, in 2012, Zadora stated that Pickfair was indeed haunted which was the 'real' reason she and her husband had the house was destroyed. The original stories actually stem from the time of the home being in Pickford and Fairbank's hands with a ghost suspected of being a 'late' female servant being seen several times by the couple and guests. An apparition of a man had been seen near the front entrance on several occasions as well, some assume him to be Douglas (who died in 1939) but it's unclear from what I can discern. In glancing conversation, I also have heard of a "woman's laugh" being heard, but again, I'd prefer some more concrete source before resting on that one. After Mary's death, her husband Buddy said he was visited by a woman in white who he took for being the apparition of Mary... he soon moved out himself clearing the way for eventually the people who'd only leave the original gates, a kidney shaped pool, the 'guest wing' (two bedrooms,) and pool house... and, apparently, a little bit of the original living room as well.